AWeber provides top tier email marketing services, features and resources for businesses of all sizes. Fully featured, hundreds of templates and an excellent mobile marketing feature, AWeber is worth a try. AWeber offers its customers an effective email marketing service, for a price that compares with the biggest names in this industry. AWeber’s inexhaustible list of features and tools, plus its premium services, promise to make the most of any business seeking to grow and expand. AWeber caters to email marketing newbies and experts altogether. Enjoy the fully-featured 30 day trial period and then switch to the plan that best suits your needs. Why Send Emails With Aweber? Take a closer look at what AWeber has to offer. The AWeber email editor is user-friendly once you become familiar with it. With more than 400 signup forms on offer, you can easily find the perfect match to launch your campaign. The Template Selection: provides over 700 email templates. However, Categories are not listed on the side, and likewise, there is no indication as to the number of templates per section. There’s an option to change templates’ color scheme during the selection process. Customization: The user interface is quite basic. AWeber offers a limited selection of editing tools and it might take you a few minutes to familiarize yourself with the editor. 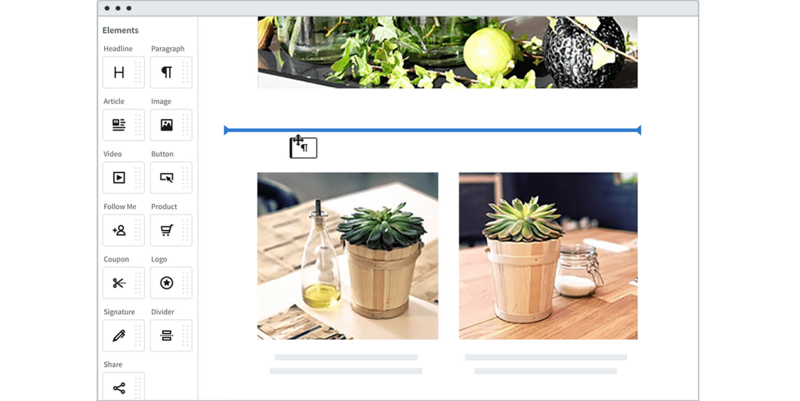 You can upload images right into the template and move content around once it’s in place. Multimedia: Easily upload your brand logo or other images into the template. AWeber does not offer any free media images or clips and no space for media storage. Choose from over 700 mobile email templates and customize them the with Drag-and-Drop Editor. HTML Templates help you create and send email newsletters. Integrates with online tools such as PayPal and WordPress via API. RSS to Email. Create emails automatically from your most recent blog posts. Call Loop feature that collects subscribers’ phone numbers so you can send SMS or text-to-voice mail messages. Quickly build email automation flows with AWeber campaign editor. Craft personalized welcome emails, educational workshops, campaigns and more! AWeber features are impressive. However, finding them and learning how to use them can be confusing. To begin with, you need to know where to go to start editing a template, as this is not clear or obvious at all. AWeber editor itself doesn’t take center stage, but is tucked away in a dark corner. Once you manage to find it, the process will become incredibly easy. The editor is very user friendly and offers some special features, allowing you to change your template’s theme from right inside the editor. If you are somewhat savvy, you can make HMTL adjustments. Watch detailed video tutorials that explain how to get your email marketing campaign started, with added information following each video. The FAQ section is also well stocked with answers to help you solve any issues that might come up. The live chat, email and phone number are listed on every page while you are logged in. Support is ready and available, but like other features on this site, it takes a little time to find your way around it. Don’t be deterred by the $1 signup fee! Unlike other platforms that limit your activity during the trial period, AWeber gives you access to ALL the features, and unrestricted emails for the first 30 days. Thereafter, you will be charged $19 a month automatically, unless you either deactivate your subscription, or switch to a different plan. Subscriptions are deferred by their length: monthly, quarterly or yearly. Within each of these periods, you may select how many subscribers you’ll address per month. Both quarterly or yearly plans are cost-effective, and all are fully featured with unlimited emails, automation, segmentation, integrations, signup forms and image hosting. There is no free for lifetime option, but the 30 day $1 trial gives you unlimited sending, restricted to 500 subscribers. If you are not satisfied by any of the paid plans, you are entitled to a 30 day money back guarantee. We recommend you sign up for the quarterly pricing plan, after having enjoyed your 30 day trial. This will save you $8 without committing for an entire year. AWeber is an ideal email marketing service for individuals and businesses with some email marketing background. With a solid variety of features on offer, AWeber, however, fails to provide mobile tracking or management. Otherwise, AWeber provides all the tools for creating a successful email campaign. Don’t be deterred by the $1 signup fee! But make sure you deactivate your credit card before the end of the month if you want to discontinue AWeber’s service. If AWeber feels right, do not hesitate to make AWeber your email marketing platform! Sign Up for the 30 day trial and make sure to report back to us!